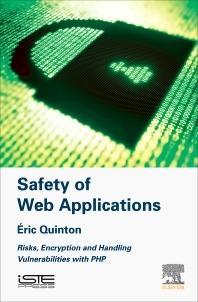 Safety of Web Applications: Risks, Encryption and Handling Vulnerabilities with PHP explores many areas that can help computer science students and developers integrate security into their applications. The Internet is not secure, but it's very friendly as a tool for storing and manipulating data. Customer confidence in Internet software is based on it's ability to prevent damage and attacks, but secure software is complicated, depending on several factors, including good risk estimation, good code architecture, cyphering, web server configuration, coding to prevent the most common attacks, and identification and rights allocation. 1: Why Do Web Applications Need to be Secure? 1.1 What is a web application? 1.2 What is computer security? 2.2 How can we protect ourselves from risk? 2.5 Which causes or scenarios should be considered? 2.6 How should this study be performed in a company setting? 6.1 Why does the application structure matter? 6.2 What is the MVC model? 7.3 What options do we have if implementing security measures for an application seems an impossible task?